The subject matter of her work was typically children dressed in early 1800’s clothing. She also drew beautiful flowers that gave homage to the gardens she loved so much. The original maker of this top is unknown to us, not unlike many other quilts from the past. This quilt may have originated in New England, possibly New Hampshire. It is a wonderful example of Redwork embroidery and is still in pristine condition today. 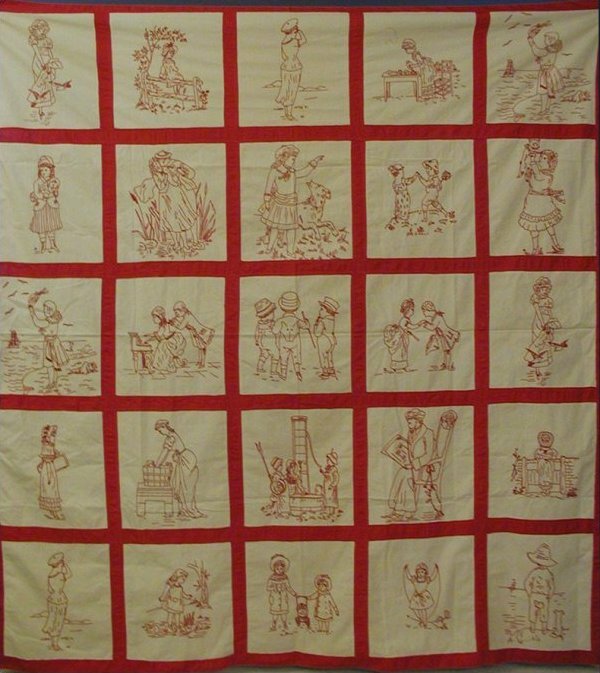 Thank you to Kathe Lemmerman for allowing Quilts Remembered to re-pattern this masterpiece. The full pattern includes a picture, the Redwork designs, directions and yardages. The pattern is full size and packaged in a protective tube.